I don’t own a telescope (yet) and I only took one course in university on practical astronomy, everything else was astrophysics. So the sad thing is that I know how stars work — from the nuclear fusion in their core to coronal dynamics (the latter of which I did my PhD in) — but if anyone asked me to point out a constellation or the location of a star… I wouldn’t have a clue. Sure, there are the old favorites, like Orion, the Big Dipper (or Plough) and bright Polaris, but my expertise in night sky viewing is pretty limited. Although I’d usually refer any astronomy-related questions to BBC astronomy presenter (and Discovery News writer) Mark Thompson, I’d love to learn more. So, firstly, I needed a star chart. 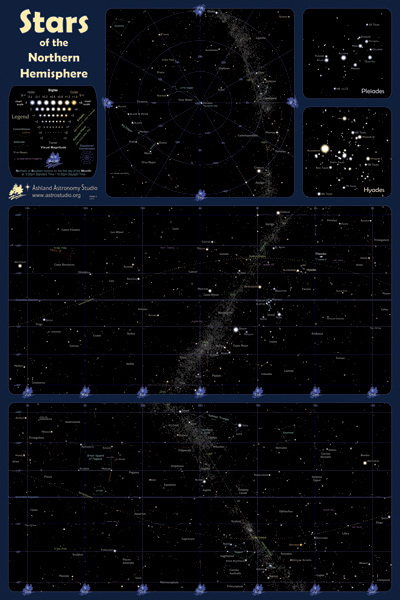 Luckily, a few weeks ago, I received a random email from Erik Anderson from Ashland Astronomy Studio asking whether I’d like a copy of his company’s new star map poster. Being eager to boost my pitiful knowledge of the constellations, I jumped at the chance. Soon after, my poster arrived through the post. Now this is where things got really cool. Although Erik had titled his email to me “Star Map with Exoplanet Hosts,” I’d forgotten about the “exoplanet” part. On the clear, yet detailed Ashland star map, all the major constellations and stars are plotted, along with the time of the year (in the Northern Hemisphere) they can be seen. But also, there’s a symbol representing the hundreds of stars that are known to have exoplanetary systems orbiting. I’m not sure if Deb was overly impressed with my exoplanet knowledge, but I was happy to be smug again. Although it’s only a very small part of an astronomer’s tool kit, a star map is essential. Although you can get apps for your iPhone, you can’t beat a poster that isn’t only functional, but also looks very attractive on your office wall. The very cool Ashland Astronomy Studio Star Map can be purchased from Amazon.